Many people have asked me in comments and in email about whitening products and spot correctors. I’ve tried quite a few in my time but the one product I’ve actually cared about enough to repurchase and which I personally recommend is the one by Clinique. This was launched about 2 years ago as the Derma White Clinical Brightening Essence, and you can read my review on it by following the link if you like. Quite honestly, this is about one of the better brightening essences and spot correctors I’ve tried. It does what it says and does not dry out my skin nor leave it feeling tight. I’ve finished it up and bought my own and even that one was on its last legs by the time I got wind that Clinique was consolidating things and changing the name of this product. Elsewhere in the world, this very same product was known as the Clinique Even Better Clinical Dark Spot Corrector which was what I noted in my previous review. To be perfectly honest, it was really confusing. 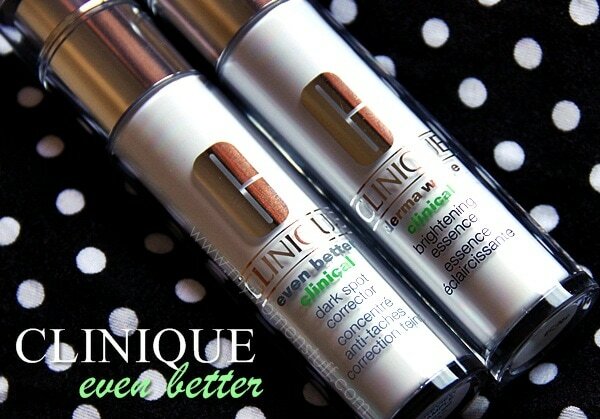 So what Clinique has done is to standardize their labelling worldwide, and in Asia, this product will be known as the Clinique Even Better Clinical Dark Spot Corrector – same brightening product, different name. If you have fresh pimple or acne marks (face it, oft times we can’t restrain our itchy fingers from squeezing our spots) I’ve found that using this helps fade the marks quite quickly. Old marks do take longer, but they will fade and I don’t find it unduly harsh. For pigment spots, it will take longer. Lighter spots will fade and lighten more quickly while more stubborn spots will take longer. I found this gives a more even toned visage and I am contemplating just sticking with this for the near future, and for maintenance, instead of using other prescriptive treatments that I find too harsh on my skin. It won’t do anything for moles, but it will help get hold of those sunspots before they get worse. Many things from Clinique don’t work very well for me too (3-step in particular), but their treatment products and general items like Moisture Surge do in general. I just bought this! But am waiting for my skin to settle down before I use it. I love their 3-step and their anti-blemish solutions too. I can’t use the 3-Step but I’ve had good results with the Moisture Surge, Repairwear Laser Focus and this one! I have this in beauty cupboard but not used it. May have to crack it open after this review! If a beauty blogger repurchases an item, then you know it’s a winner! And isn’t that the truth! I can’t remember when I repurchased anything LOL! thank you for this post. my next purchase, definitely! Haha you and your whitening serums! I actually really like this one, too – I’ve gone through two or three bottles, I think. I haven’t repurchased recently because it’s a bit steep, but I think Sephora makes giant bottles now, too! I wasn’t sure it was working, but then a Clinique SA charted the darkness of my spots for me against a color card, and several months later, I went back to check back – they were definitely lighter! I’ve tried this and I feel MEH about this product. I rely on retinol – it’s more heavy duty and effective, if you can tolerate it. I’d say that compared to something prescription based or retinol, this would be quite a let down 🙂 But for something a little less harsh on the skin I suppose it’ll do! How do you apply the serum? Do you pat in on or do you rub it in? I find the texture quite odd and rather cumbersome to work with. I need to revisit this again, I used it many years ago but never used it all the way through. I don’t have any sun spots or moles or any brown colored spot, I may have some acne spots (1 or 2) but I in fact have another problem. I am starting to get bronzer each year!!! That was a funny sentence 🙂 The thing is my (sunburned) color doesn’t fade away each year, I was like nc 25-30 two years ago and now i am more like nc35 :S I don’t know it is helps to a little brighten me at overall, do you have any idea? Yes it will help brighten skin but for best effects it might be best to use a whole range of whitening/brightening skincare. Asia has lots of brands but I’m not sure how many are available in Europe. I enjoyed reading your review. I recently just finished my first bottle which lasted me about 4 weeks. I maybe am using more than I should but that’s just what I do. I was bummed to go through it so quickly but I did like the way my skin looked with it. I want to re-buy and I was browsing ebay for a deal. The ones labels “derma white” are significantly cheaper than the “clinical dark spot corrector” even though both seem to be coming from the US. Cant help but think the derma white one is an older version, or if there is a difference in formula? why the diff names?? Hi Nina, the product is now called Even Better and Dermawhite will be discontinued, or already has been. It was previously only available in Asia I believe but its now standardized. Thanks for sharing, I will check for this and see how I like it. I may do a review on it if it works for me.